The Lipscomb Bisons basketball team has won eight straight games. And now are ASUN champions headed to the NCAA tournament for the first time in school history. Behind the 108 – 96 win on Sunday against Florida Gulf Coast was the steady hand of point guard Kenny Cooper. He led the team with one of his best games this season. Cooper has had to fill an unexpected role this season. Point guard Nathan Moran was not able to play this season due to an offseason surgery. The sophomore stepped into the place of a senior. This season, Cooper had the second most steals in the league with 63, only five behind the ASUN conference player of the year Zach Johnson of FGCU. He also led the Bisons in assists with 119 assists averaging four a game. Even without playing this season, Moran has played a role for Cooper, too. Cooper said he’s also learned some things on his own through this experience as a leader. As a new leader, the season wasn’t easy, but Cooper saw potential for success from the start. In the championship game Sunday afternoon, Cooper was at the top of his game. He had 17 points, nine assists, five rebounds, one steal, and only one turnover. The only downside to his stat sheet was in the foul column. Cooper picked up his fourth foul with 13:57 left in the second half. Lipscomb had a 24-point lead, but that was all about to change. After Cooper was subbed out, FGCU went on an 8 – 0 run cutting the Lipscomb lead to 16. Lipscomb hadn’t made a field goal since 14:24 and did not score another field goal until Eli Pepper laid it in for two at 8:23. During that time, Lipscomb turned the ball over eight times. The team was suffering from a strong full-court press by FGCU, and the Eagles seemingly unstoppable three-point shooting. FGCU was slowly chipping away at a once 32-point Lipscomb lead. All Cooper could do was watch from the bench and encourage his teammates. “It was nerve-wracking,” Cooper said on watching the lead fade away from the bench. “But at the same time, as a point guard, as a “quarterback,” you’ve got to stay calm and keep on encouraging. By the time Cooper was subbed back in to finish the game after a couple short appearances on the court, there was only 3:06 left. FGCU had cut the massive lead to seven points. 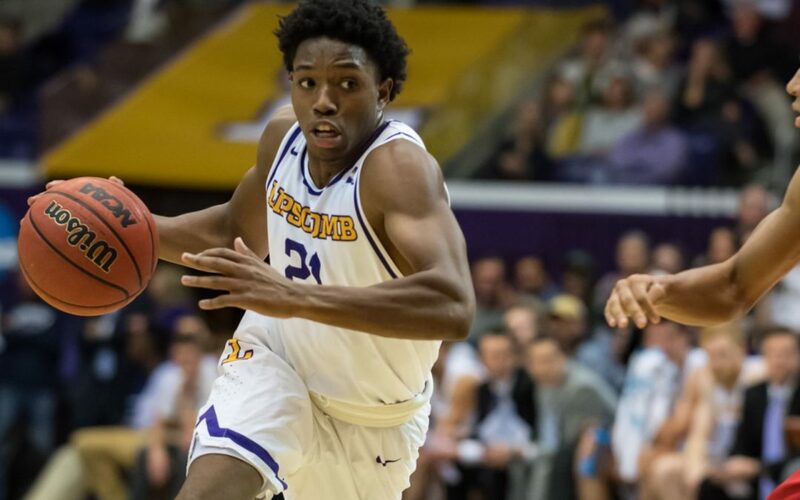 Through free throw shooting, defensive stops and strong defensive rebounding, the Bisons were able to hold off a FGCU onslaught to take the title. Down the stretch, Cooper was a key player. He hit six free throws and came up with three defensive rebounds to help seal the deal. Lipscomb fans were in the gym to celebrate with the team in a gym full of FGCU fans. And their support was heard. By overcoming FGCU’s comeback effort, Lipscomb avoided losing the game after having an enormous lead. This wasn’t the first time Cooper or Lipscomb has seen a comeback like this one looked like it was going to be. Cooper’s Franklin Road Academy Panthers lost to Harding Academy in overtime 87 – 84 after having a 31-point lead in the third quarter. On Sunday, Lipscomb gained a 32-point lead after Cooper knocked down a pair of free throws with 16:33 left in the second half. But luckily for Cooper and the Bisons, history did not repeat itself. This wasn’t the first time Lipscomb had seen a large comeback effort this season from Florida Gulf Coast either. The Bisons faced the same challenge against FGCU. But the last win against FGCU meant much more to Cooper. Cooper, along with coach Casey Alexander, sees this as just the start of something special. Not only does Cooper see this extending beyond this season, but he sees the effect it has on the fans. The team was greeted in front of Allen Arena when the bus returned from the airport Monday night. The players were met by hundreds of students. Cooper and the Bisons find out who and where they will be playing this Sunday in the Selection Show on TBS at 5 p.m. central time.